The new, colourful décor from Böckmann generated positive feedback at Equitana. 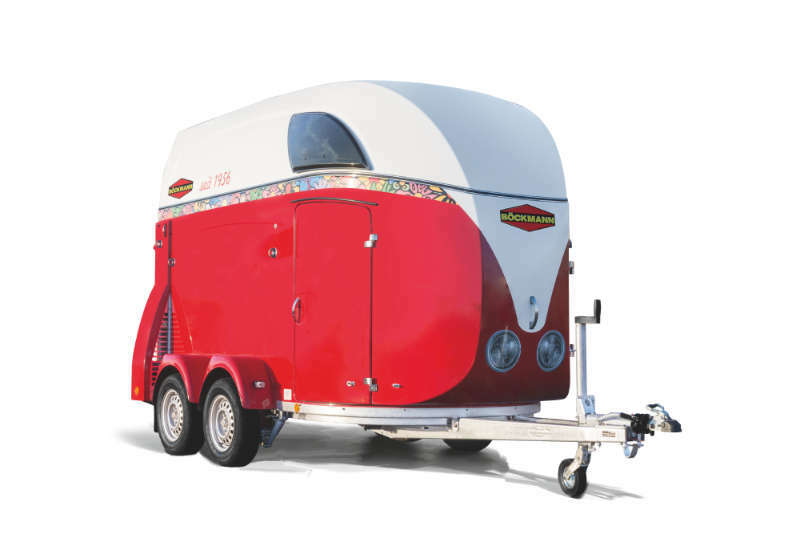 Many customers have recognised this trend for colour since the market launch and are ordering their new horse trailers adorned with this bold décor. The new drawings, just like all other previous Böckmann décor offerings, are by the founder of modern horse painting, Jan Künster. He created the popular eye-catchers that make each Böckmann horse trailer or horse truck a distinctive and unique piece of art. Jan Künster is himself an enthusiastic rider and driver. With his current works, he once again did an excellent job for Böckmann, supplementing the existing range of décor. Anybody who likes a bit of colour is sure to enjoy the new décor by Böckmann. The décors are available from every Böckmann dealer as both small and large versions. The new Portax: Very easy handling meets unbeatable roominess. Standard features include extensive comfort and safety features, the new Portax will be the perfect companion for the equestrian life. This trailer offers not only an excellent driving experience but also always leaves a lasting impression with its striking appearance. Those who have experienced it, will not want to do without it. Currently the new Portax is available at the advantageous price of €975. Since 2007, the Portax family stands for comfort at the highest level for horse transport – before, during and after the journey. The Portax E, K and Pro models were first introduced in the new design at Equitana 2015. They combine ease of handling with a generous space provision. Whether breeder, cross-country, competition or Western-style riders – the new Portax impresses with its versatility. The all-rounder is now offering comprehensive added value for horse and rider: Among other things, the proven world-class "WCFplus" suspension conforming to automobile standard allows as standard for even greater driving comfort and the Portax also can beconveniently loaded from a forklift truck through the back door/1-wing door combination in order to transport, for example. feed or round bales. 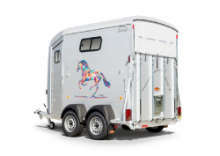 The Portax models impress with an interior height of 2300 mm, man-high access doors and aluminium centre post partition walls which can be pivoted to left and right, which allows easy loading for horse and rider. 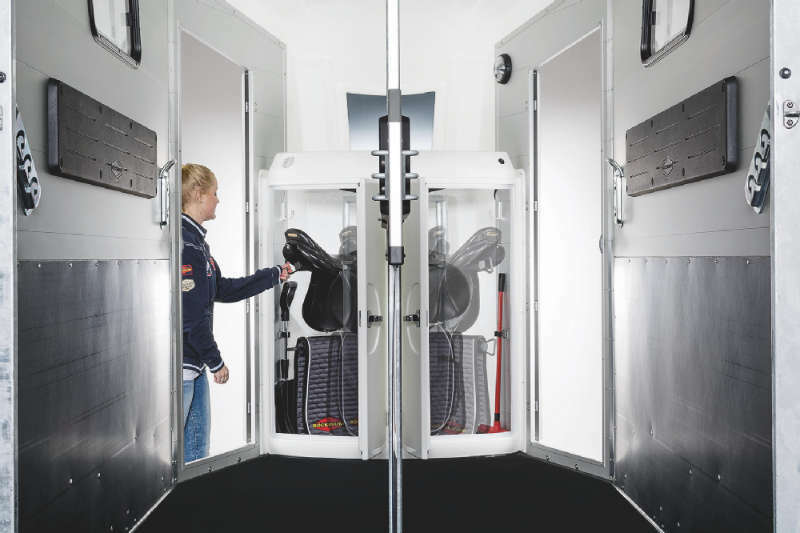 One particular innovation is in the very spacious tack room in the front part of the Portax E: Via two doors, the freely rotatable saddle carousel is easily accessible with two saddle holders retractable inside and out. Equipped with plastic bucket, telescopic broom, bridle hooks, door net and mirrors, the space provides room for other equestrian gear. 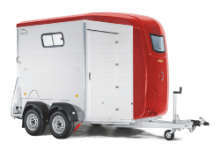 Currently the new trailers are available at the advantageous price of €975. The world-class "WCFplus" suspension according to automobile standard and the rear ramp/1-wing door combination are now standard in the new Portax models compared to previous models. All details and more information are to be found at www.portax-fuer-reiter.de, here a free information package can also be requested. Very easy handling meets unbeatable roominess: With the many standard comfort and safety features, the new Portax E will be the perfect companion for the equestrian life. The innovative saddle carousel in Portax E is accessible in a comfortable manner on both sides from the inside and outside via the two man-high access doors. The Portax K has a wide and extra long front unloading ramp for easy exit. Böckmann Fahrzeugwerke will present itself with 30 horse trailers and six horse trucks at this year´s Equitana trade fair in Essen, Germany. The pioneer in the industry meets all requirements with its broad range of products – and that's just as true for the horse and rider. With a total booth space of 1,200 m², Böckmann is once again the largest exhibitor at the trade fair. Specialist dealers from North Rhine-Westphalia and the surrounding German states are available to visitors with their knowledge on every aspect of the Böckmann products. We all look forward to the latest product developments. 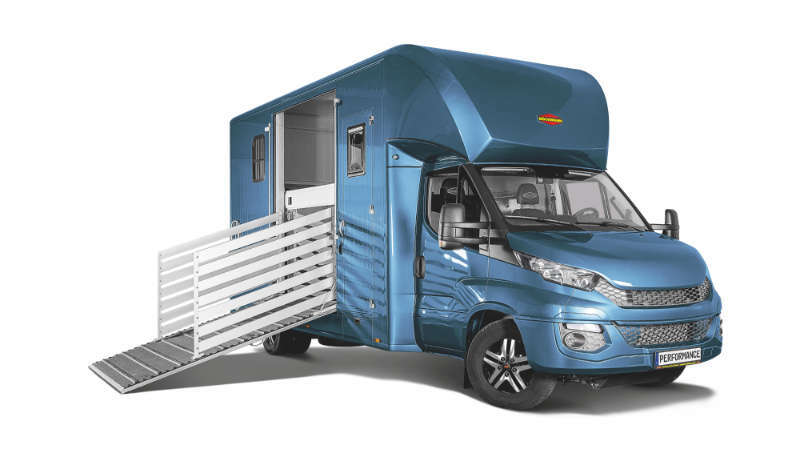 Böckmann has announced a new horse trailer model and a further development of the "Compact" horse truck model line for the world trade fair for equestrian sports. 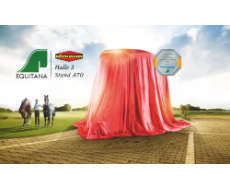 Visit Böckmann at Equitana in Hall 3, Booth A70. With the new Compact, Böckmann has conveyed the feeling of the ride and comfort of a passenger car in its proven miracle of space. The new design, the spacious layout and functional trim give the horse and rider enjoyment every day. Böckmann gives a 7 years durability guarantee for the aluminium floor construction and the aluminium wall structure., The three basic models, Basic, Stall and Sports can be combined with one of the three trim packages, Team, Tour and Pro.The Compact can be tailored exactly to your own requirements with other extras. By means of an extended chassis, the basic models Basic, Stall and Sport can be upgraded with extra space between cab and horse compartment. The gained space can then be fitted with additional seats (Option Team) or an additional living area (Option Tour). In the professional version, this space is not available but thereby the rear saddle room is automatically increased which offers plenty of space for changing clothes and lot of storage space. Böckmann focus on Western. At the Americana fair the family business from the North German Lastrup presents a series of horse trailers especially for western riders. 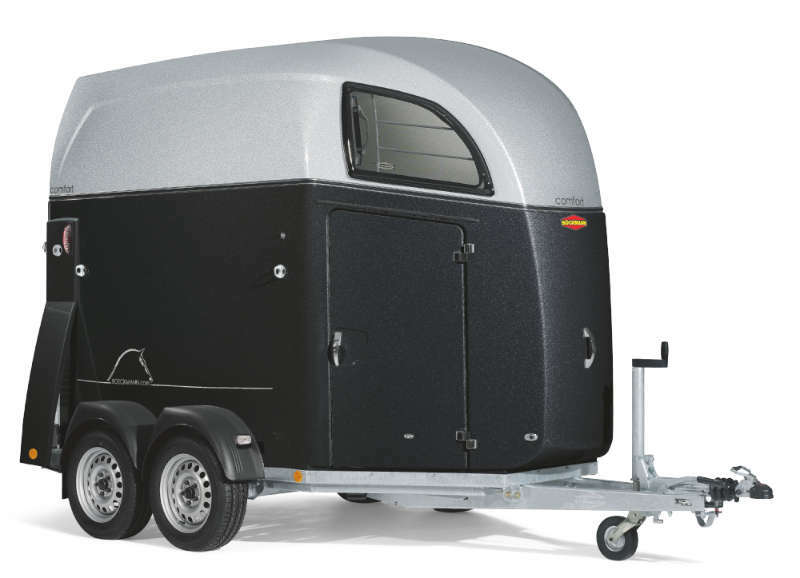 In Addition to the standard models for classic riders Böckmann also develop professional high quality horse trailers for the demanding western rider. A highlight will be the Portax Profi. This model was recently presenting at the Equitana fair and is equipped with a spacious and full-height tack room. Swivelling saddle racks, shelves, saddle cloth holders, plastic shovels, telescopic brush, bridle pegs, mirrors and door nets are included in the standard equipment. All Böckmann Western models are characterized by a series western decor. This decor shows a “Sliding stop”, the defining brand of western riders. In total Böckmann shows eleven high quality horse trailers at the Americana fair in Augsburg. Among these trailers you will see the Duo C, Champion R, Comfort and Big Master with western equipment. At the Böckmann stand you will also find the Portax K including a front unloading hatch on the right side and the Portax Profi. By means of the Traveller western models the transport of up to four large horses is possible. Also interesting for western riders: The Big Portax Cross. The space-saving diagonal position of horses allows using the space in an optimal way and facilitates the transport of two or three medium-sized horses. Even the Big Portax with longitudinal position for two horses convinces with its generous room layout. 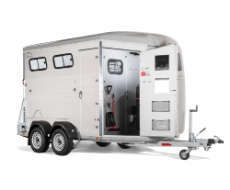 Nevertheless of a huge horse compartment both models offer plenty of storage space due to a walk-in tack room. In any case a visit of the traditional company is profitable. In hall 1 at stand A05 you can convince yourself of the proven Böckmann quality from 2nd to 6th September – trailers made “by practitioners for practitioners “. This is the equestrian event in, and around, Oldenburg. The Agravis Cup in the Weser-Ems-Halle in Oldenburg, North Germany, had around 20,000 visitors over the four days the tournament - once again this year the International Equestrian days, in the meantime the Agravis Cup, have been able to mobilise riding fans throughout the north-west. The mixture of international sport of the highest level, regionally famous contestants and targeted talent promotion is long-established. Böckmann also recognised this fact and they have a presence on an exhibition area of 150 m², showing two models from their Compact range for two horses (Stall Profi and Basic Team) alongside a horse transporter for five horses, including a living area of 300 cm². The fact that Böckmann also builds Horse Trucks was a surprise even to local visitors, the renowned manufacturer from Lastrup is better known as a manufacturer of high-quality Horse Trailers. Reason enough for visiting the 3,000 m² Horse Truck Center in Lastrup. Visitors to the Niederrhein Equestrian Exhibition were able to see the latest products and developments by Böckmann for the first time. The pioneering company was showing six Horse Trailers to the trade on an exhibition stand covering 120 m². The exhibits included the recently launched Portax E with its innovative tack room concept, which was nominated for the Product Award at the Pferd und Jagd (Horse and Hunting) exhibition in Hanover (from the 3rd. to the 6th. December). 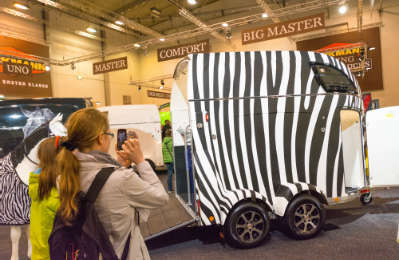 The trailer expert from Lastrup was able to report strong demand, particularly for the Western version of the Comfort, no doubt due to the fact that Western riders were particularly strongly represented at the exhibition in Kalkar. Böckmann declared themselves to be generally satisfied with the response and they are taking a relaxed view of future equestrian exhibitions over the next few years. 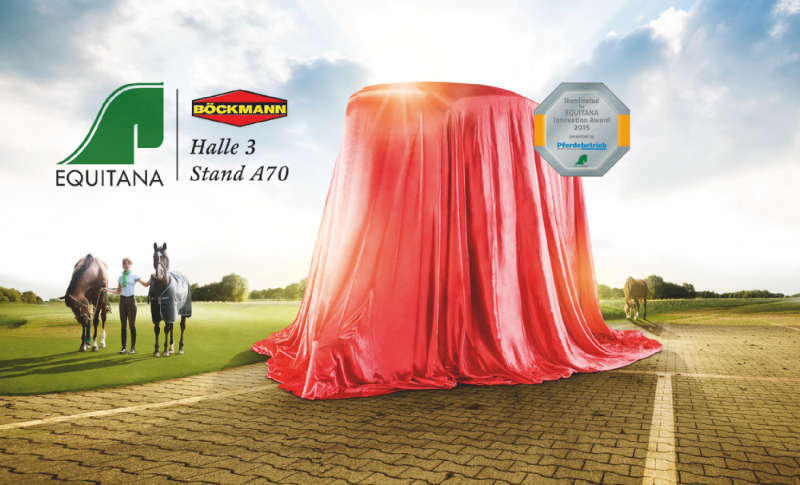 Once again, Böckmann has demonstrated its progress by being nominated for the "Product Award Innovation Horse 2015". The revolutionary tack room concept on the new Portax E Horse Trailer reached the list of 15 finalists in the competition at the Pferd & Jagd (Horse and Hunting, 3th – 6th December 2015) equestrian exhibition in Hanover, Germany. During the exhibition the trailer was presented at a separate exhibition area in Hall 24 (Country) and appears in the latest issue of Reitsport magazine. 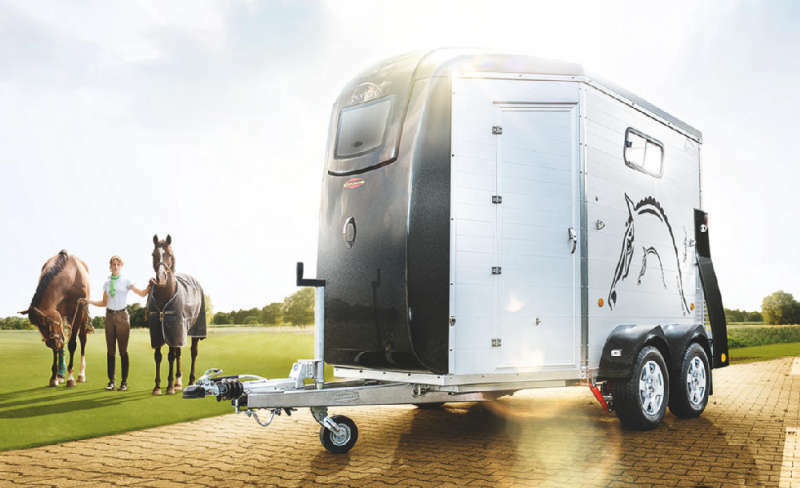 The innovative carousel system ensures that the tack room on the Portax E is available both from the inside and the outside of the trailer from both sides. The new modern design and the repositioning of the nominated tack room means that there is lots of room for working in the new Portax, particularly in the front section. Once again, a real benefit for horse and rider from the house of Böckmann. The new Portax Horse Trailer has already been advertised successfully using a wide range of video material. Based on the positive reception, Böckmann decided to continue to employ moving images. The innovative tack room concept in the new Portax E from Böckmann impressed the expert jury of the “Horse Innovation 2015” Product Award at Pferd and Jagd in Hanover. The Portax E with its tack room was a major attraction throughout the well-attended exhibition in Hanoverannovere. You can see exactly how the saddle carousel works on Böckmann’s website, or on our new YouTube channel: www.boeckmann.com/youtube. Winter is approaching and the days are getting shorter, and many Horse Truck owners are presented with the question: How do I make my horse transporter ready for the winter? It's not enough simply to park the vehicle up. Certain other requirements are necessary in order to be able to rely on the famous Böckmann quality after the winter. This starts with draining the water from the tanks. You must always carry out a thorough cleaning process, at least for hygienic reasons. In addition, it is also important to leave the drain valves open so that any backed-up residual water can escape in the event of frost. Failure to do this will almost certainly result in damage and expensive repairs. Thorough external cleaning should always be part of the obligatory routine. This requires detailed work. Wheel housings, underbody and roof, all need washing down – and everything should get a thorough cleaning. However, you must be careful with tyres and rubber seals. Powerful high-pressure washers can cause damage to sensitive points. In these cases it's best to revert to the tried and tested sponge method. It is also advantageous to top-up the radiator and the screen wash with antifreeze. All the locks should be treated with lock spray. Of course, the driver's cab should also be thoroughly cleaned and allowed to dry with the window open. 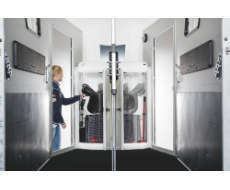 Böckmann tip: Spray or rub the door and window seals with special rubber care products. Firstly this prevents the seals from freezing up and secondly it makes the seals supple again. This counteracts rapid ageing. Leave all the cupboards, drawers and the refrigerator door open in the living quarters. One solution may be to leave a rolled-up towel between the door and the cupboard. The cushions on the seats must be placed upright at a suitable distance from the side walls. You should always: Ventilate the living quarters well at regular intervals. We recommend using a suitable fan heater to keep the temperature above freezing, because residual dampness can produce toxic mould and wooden furniture does not like temperatures near freezing point. Böckmann tip: It won't hurt to place a few mousetraps in the living quarters and in the horse standing area. In this way you can prevent damage to electrics, PVC dividing walls and the high-quality interior fittings. By using room dehumidifier cushions (available from all DIY stores) you can ensure that the residual moisture is absorbed and does not deposit in the furnishings. Check the technical systems! The vehicle battery and the auxiliary battery should be fully charged. Increase the tyre pressures by about 0.5 bar to prevent the tyres from developing a flat. 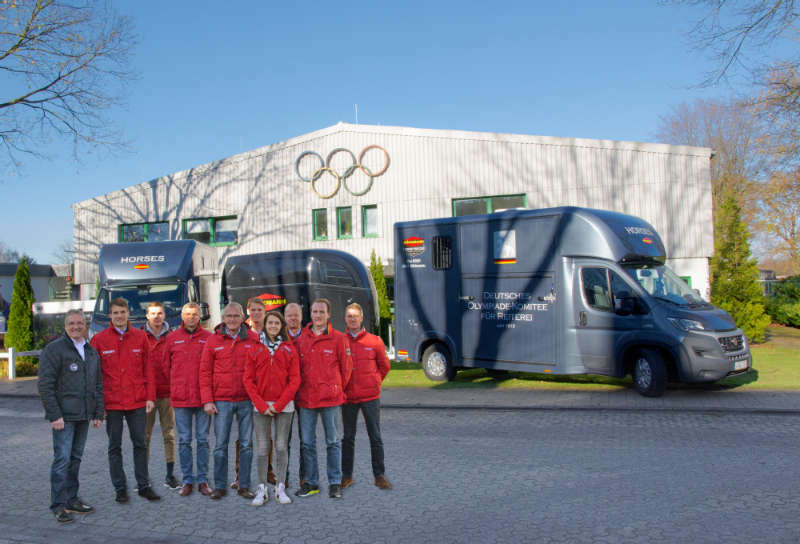 Böckmann has delivered two horse trucks in the Compact Stall series to the German Olympic Committee for Equestrian Sports (DOKR) in Warendorf. The vehicles will be used primarily for the members of the Talented Young Show Jumpers group at the Warendorf National Training Centre. "This makes coordinating trips to competitions and external training activities so much better simply because you have more flexibility with two vehicles," says Dr Dennis Peiler, the Managing Director, who decided on Böckmann. One reason for his decision was the manufacturer's many years of experience in equestrian sport. Böckmann has worked the functions important to horse and rider into a well-designed vehicle concept. 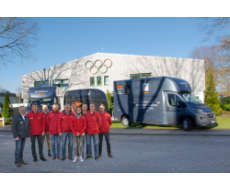 The numerous coaches at the National Training Centre were able to verify this during the handover in Warendorf and were enthusiastic from the start about the many different transport options offered by the Compact Stall. A flexible partition system enables you to create an amazing amount of space inside the vehicle – ideal at your stable or for travelling to a competition. Böckmann wishes the National Training Centre many years of happiness and success with the two new Compact models. This has never been seen before! The members of the 8er team, riders who have achieved a mark of 8.0 or more in events, have the chance this year to win a brand-new Böckmann Horse Trailer. 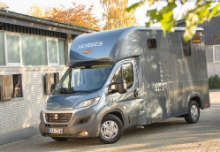 Böckmann, the horse transport expert from Lastrup in North Germany', is providing its most popular model, the Comfort Horse Trailer, for the prize draw at the Baden Classics. This is bound to make the rider scene happy. 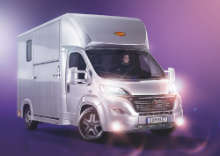 The Böckmann Truck Center now offers a rental service for their Compact Horse Transporter range. 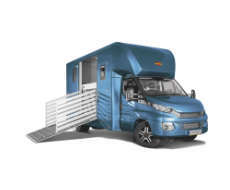 The models are suitable for the transport of up to two horses and offer a wide variety of transport options thanks to their adjustable partition walls and well thought-out spatial concept in the variants Basic, Sport and Stable. If you want to drive the Böckmann Compact, you can now rent the models for as little as € 150 (net) per day. The special Tournament Package, covering the rental period from Thursday to Monday (€ 490 net), means that there is nothing to stop you providing professional horse transport for a successful tournament weekend. If required, we can arrange a viewing appointment beforehand in the Truck Center in Lastrup. It goes without saying that technical instruction by our qualified experts and a test drive on-site are possible. 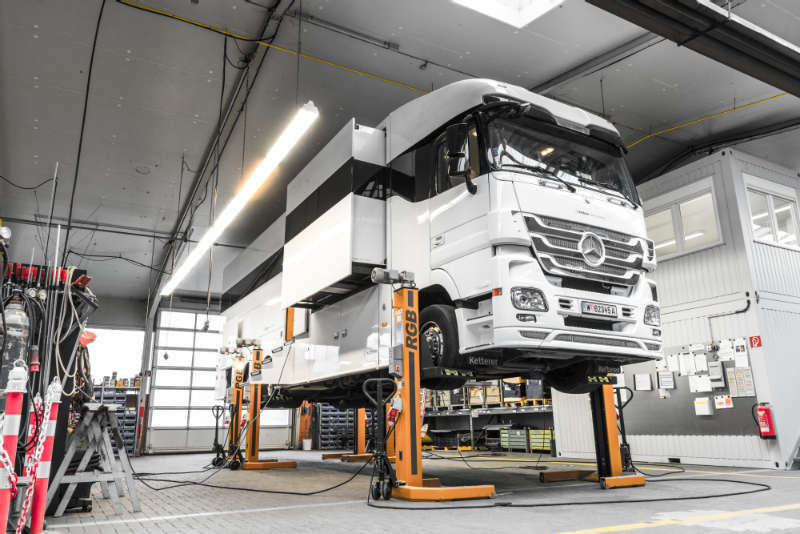 Further info and answers to your questions can be provided by the Böckmann Truck Center on +49 4472 / 895 960. More detailed information about the transporters for two horses is available at www.boeckmann.com/trucks. With impressive pictures, the show rider Lorenzo puts the spotlight on a Böckmann Big Portax Cross in a video. With his Lusitanos, Lorenzo was able to produce spectacular shots of horse, nature and trailer. With his breathtaking liberty horse performances, Lorenzo regularly provides entertainment of the highest level for his fans and spectators. Lorenzo's basic principles include respect for and trust in his horses. The result is amazing. At the end of the film you see the horses galloping towards the Böckmann trailer and immediately trying to get into the roomy Big Portax Cross. Thanks to its inclined position, it provides sufficient space for up to three medium-sized horses. Lorenzo appreciates this and decided on precisely this roomy horse trailer. You can find more on the Big Portax Cross here. 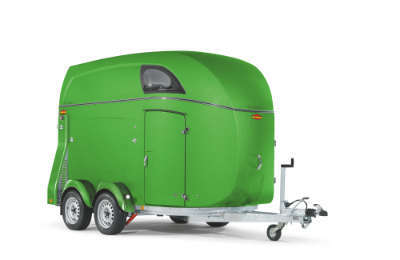 Böckmann Fahrzeugwerke was commissioned to design a special trailer for Mählmann, the vegetable producer from Cappeln. The aim was to develop a trailer which would provide a robust sanitary facility with toilets for the large number of harvest auxiliaries working in open fields. These special trailers mean that Mählmann is spared the effort and expense of erecting and dismantling large, heavy, portable toilet cabins. The low weight provides a critical advantage. 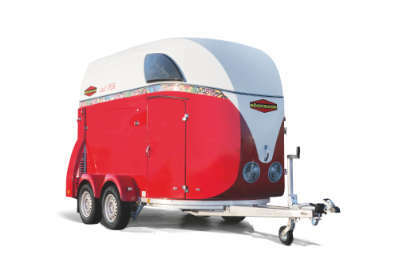 The body of the trailer has been reduced to the minimum, while retaining the most important features. This means that the risk of the single-axle car trailer becoming stuck in the soil is reduced. Steel mesh flooring allows not only a reduction in the weight of the trailer but also facilitates easier cleaning. The trailers can by transported using a conventional car without any difficulty. 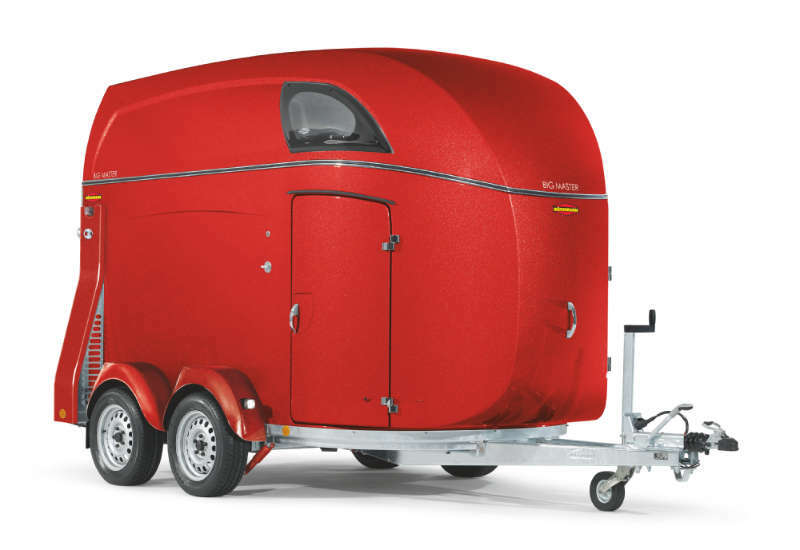 Böckmann offers customised solutions in the design of trailers for cars. A Böckmann dealer will be pleased to discuss your requirements. You can find your nearest local dealer using the dealer search. The jumping and dressage Derby in Hamburg is the most attractive Derby for the world’s elite of equestrian sport. Böckmann Fahrzeugwerke from Lastrup is also present with its own presentation surface. Not even the horse trailers provide a similar attraction to the equestrian world, but also the Böckmann Horse Trucks are a crowd puller on the event in Hamburg-Klein Flottbeck. 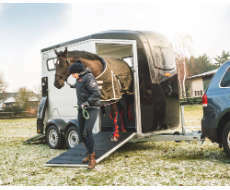 This year Böckmann brings along a horse transporter of the Equipe series for the transport of up to five horses as well as two Compact models for up to two horses. Convince yourself of the quality of Böckmann horse transporters at the Derby in Hamburg from 04th to 08th May 2016. We wish all participants of the competition good luck! Böckmann is celebrating its 60th anniversary in 2016. That is reason enough to celebrate and a special time to bring joy to people in the neighbourhood. Klaus Böckmann instigated a campaign of donations for the remedial kindergarten in Lastrup, resulting in the collection of €4,000 through a tombola and voluntary donations by his employees. This money has now been handed over to the kindergarten on the Birkenweg. Josef Hespe, Head of Marketing & Sales, participated in the morning chair circle at the kindergarten with all 42 children, and then handed over the symbolic cheque to the head of the Caritas facility. 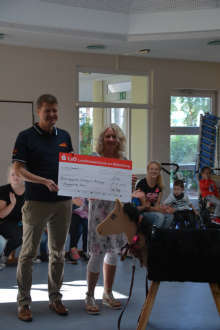 The whole group accompanied the handover with a song of thanks and all the children were thrilled that this donation would allow the realisation of another therapeutic riding project with the Reha-Sportverein Löningen e.V. next spring. This special form of riding focuses on promoting the mental, social and physical development of the children. Böckmann is looking forward to visiting the children when they have their riding lessons! 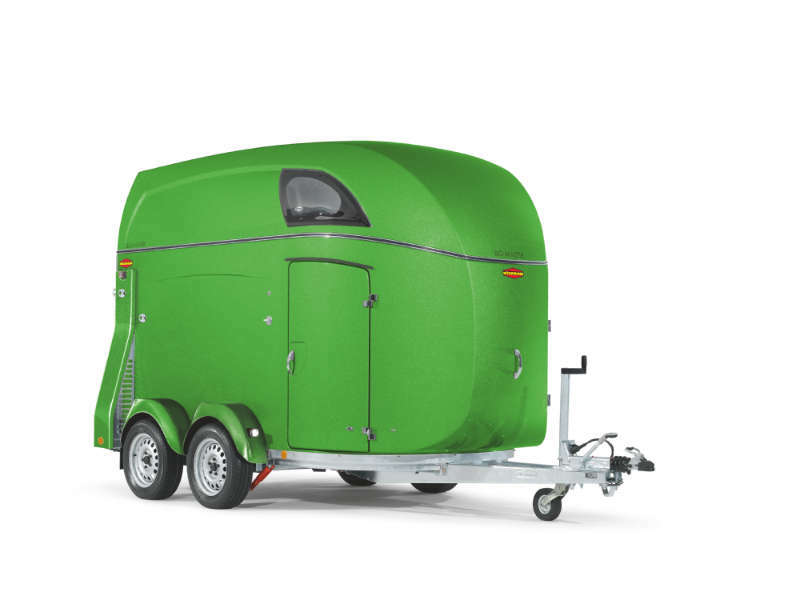 The Volkswagen Trailer Assist system makes reverse parking a Böckmann horse trailer childsplay. This was demonstrated impressively by VW at the Celle State Stud, with celebrity endorsement from Janne Friederike Meyer. It did not take our VW partners long to decide how to demonstrate the system; it had to be a Böckmann horse trailer. As a world first, the system was built into the VW Passat and was released on the market in autumn 2014; it is now available for the Touran and Tiguan as well. Reverse manoeuvres are easy: The driver puts the vehicle into reverse gear, presses the parking assistance button on the centre console and takes their hands off the steering wheel. The mirror adjuster works like a joystick that controls the car with the Böckmann trailer. This determines the required steering angle and the corresponding articulation angle of the vehicle and trailer is shown on the display. Now all the driver needs to do is gently to depress the accelerator — or in an automatic vehicle, take their foot off the brake — and the vehicle starts moving at a controlled speed, whilst steering automatically. The system detects the length of the drawbar, making it ideal for both horse trailers and other car trailers. 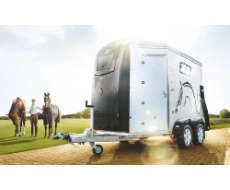 The enhanced VW systems not only make it easy to manoeuvre a vehicle with a trailer, but also make it possible to keep a constant eye on the horses. Thanks to MirrorLinkTM technology, a camera image of the Böckmann horse trailer interior can be linked to the vehicle display (GPS) or a smartphone. The VW Trailer Assist system, combined with a Böckmann horse trailer and other innovations, was tested by invited guests (press) and the successful show jumper, Janne Friederike Meyer, against the idyllic backdrop of the Celle State Stud. The celebrity rider was impressed by the effortless compatibility between the new Tiguan and the Böckmann horse trailer, and found it the combination well-suited for navigating the often muddy and narrow parking areas at tournaments. As of now, Böckmann Fahrzeugwerke can be found on Facebook. The manufacturer of trailers and horse trailers decided to take this step to be able to provide their customers more rapidly with the latest news, tips and valuable information. Already during the first few hours after the launch of their site, the company could generate more than 300 "Likes"! This initial success reflects the fame of the old-established brand at the North German Lastrup. It confirms Böckmann's decision to start using the communication channel intensely for their communication. 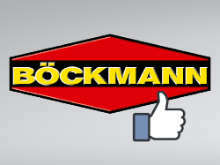 The intention of the Böckmann presence on Facebook is to establish an even closer contact to their customers. 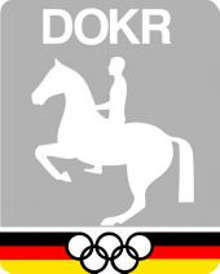 Böckmann invite all horse enthusiasts and trailer users to mark the site with a "Like". Direct access to the Facebook site. 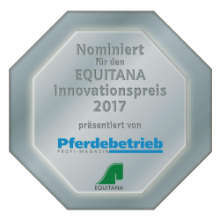 The recent nominations for the Innovation Award of the "Pferdebetrieb" magazine received during the Equitana once more proved the remarkable innovative power of the company Böckmann. After the new Portax L SR was elected Best-of-Class product at the trade show "Pferd & Jagd" in Hanover, it now has to convince the expert jury at the Equitana. 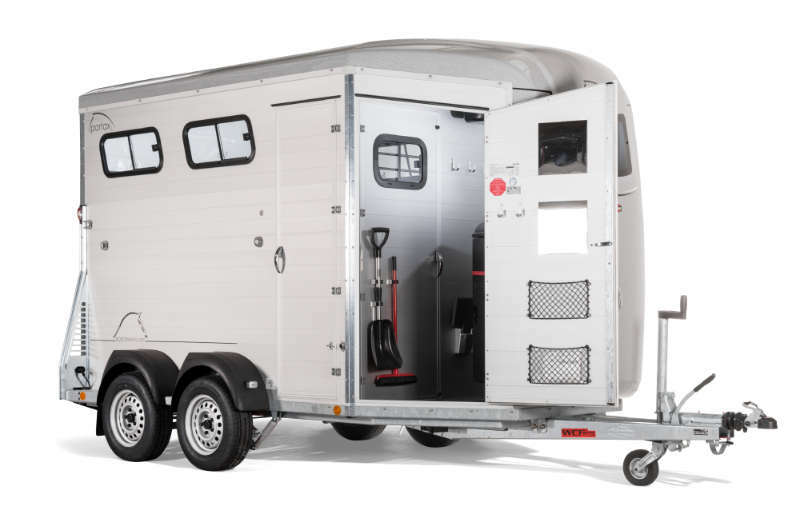 With its spacious saddle area, the Portax L SR is setting new standards for horse trailers. 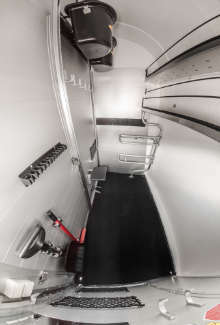 Storage systems, hooks, nets, and additional seats add more flexibility. The walk-in saddle room is large enough to move about a saddle box without any problems. It goes without saying that the trailers are equipped by default with rotating saddle holders for English or Western saddles. A towing vehicle with 2.5 ton hauled load such as a VW Tiguan can tow the large horse trailer. The newly developed horse truck Performance Trio was nominated as well. As the name suggests, this vehicle can transport up to three horses. The horses are conveyed diagonally and reverse to the travelling direction. This allows for loading and unloading via the tailgate but also via the side hatch. Sliding windows in the walls and two roof ventilation hoods provide for fresh air in the spacious horse cabin with its height of 245 cm. With its 200 hp motor, the Böckmann Trio is a powerful vehicle which can furthermore tow a trailer with a total weight of 3.5 tons. With 7,2 tons total weight, the Trio has a useful load of max. 2,000 kg! The ample living area has a large passage to the driver's cabin. A practical feature: The swivelling passenger seat can also be used as seating for the living area. A well-equipped kitchen unit with sink, fridge and a number of cabinets, as well as a shower make the living area comfortable. Saddle cabins arranged at the sides offer sufficient space to store a variety of riding gear. Böckmann, the market leader for horse trailers, also manufactures carriers for the safe transportation of up to twelve horses. Competent support is a priority for Böckmann, and is also provided for vehicles by other manufacturers. 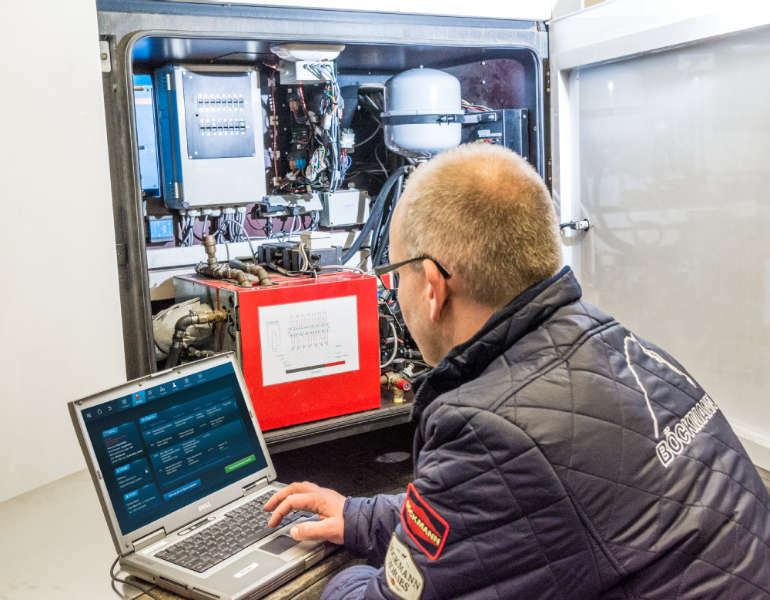 The premium Böckmann support concept comprises services such as technical inspections, chassis and paint work, maintenance of the living area, as well as repair of heating and air conditioning systems – all from one source. With their more than 60 years of experience in vehicle construction, Böckmann is a specialist for aluminium and plastic structures. In case of accident, Böckmann repairs minor or major damage quickly and professionally on their premises at Lastrup in Lower Saxony. The comfortable pick-up and delivery service all over Europe saves our customers' valuable time. For the time it takes to repair you vehicle, Böckmann offers rental trucks at a reasonable price. The rental period can be arranged flexibly in accordance with your requirements. 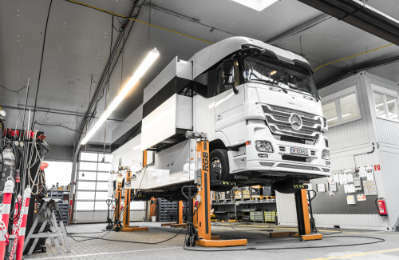 To get quick and competent advice, call the experts of Böckmann Truck Center at +49 (0) 4472/895-970 Mondays to Thursdays from 8 a.m. to 4 p.m., and Fridays from 8 a.m. to 12 noon. Appointments are available at short notice. 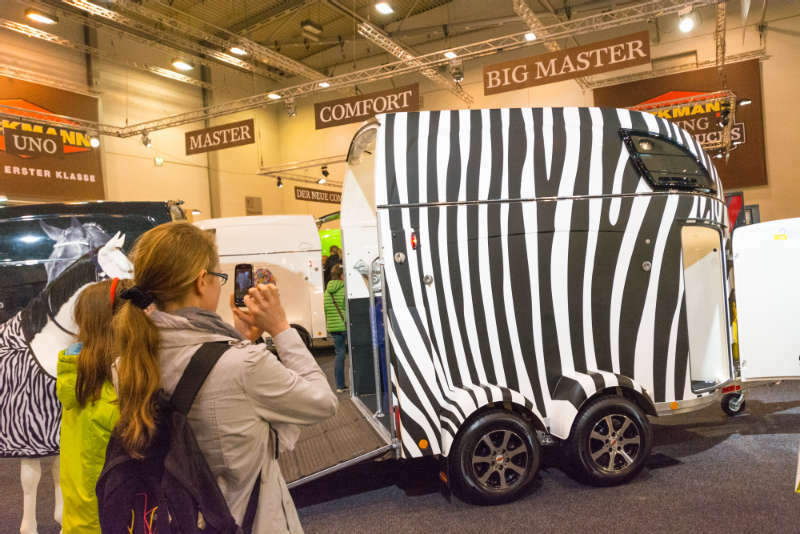 When it comes to customising the new horse trailer, Böckmann has something for everyone. 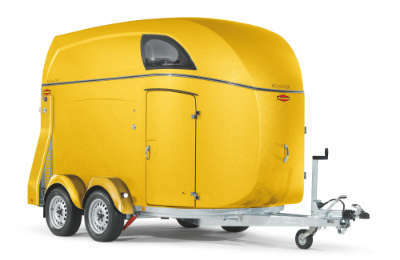 When purchasing a new trailer, customers can pick a colour from classic metallic silver and deep orange to striking yellow green. The range of available colours leaves nothing to be desired. Böckmann can even fulfil special colour requests at extra cost. For even more individuality, you can also decorate your trailer with special sticker designs. At Equitana, Böckmann will present just some of the visually striking design options. Two horse trailers of the models Big Master WCF and Master WCF in a chic “flower power” retro style and an exciting “safari” design with zebra stripe stickers show off the creative versatility of the trailers. It is even possible to have photo prints of your horse on the side walls and rear ramp. 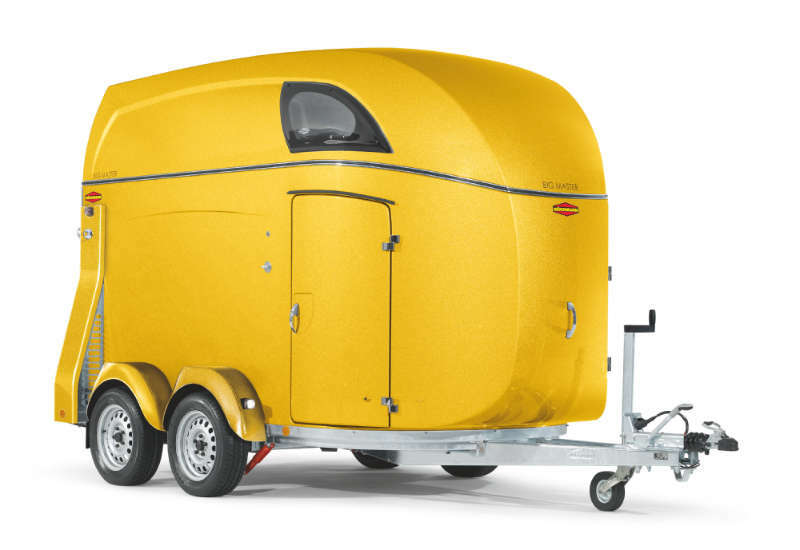 These uniquely designed horse trailers will stand out on every show ground, so they are bound to attract admiring glances. Information about special colours and stickers is available from Böckmann dealers. Böckmann’s Big Portax has an aluminium body and provides a fantastic amount of space. And now Böckmann has redesigned the walk-in tack room in this robust two horse trailer, adding very well thought out features. New: the partition wall between the horse compartment and tack room now continues up to the roof which keeps dust and leftover hay out of the tack room. The tack room in the Big Portax has enough space for a large saddle box. Böckmann has paid special attention to the rider's convenience: there is a folding seat, plus a bootjack, extra feeding troughs, storage nets and shelving in the bow to complete the package. The strong shelving can take heavy weights. The shelves have holes in them, making them easy to clean. With an internal width of 1.85 metres – 15 to 20 centimetres more than on most horse trailers – there is plenty of room for large warmbloods. The internal height is 240cm, providing ample headroom, and incidentally exactly the same as in the new Compact truck models. The ramp is 180cm long which means it lies almost flat. The multifunctional Big Portax lets you take big horses and a fair amount of luggage with you on your travels. More information at www.boeckmann.com or at your local dealer. The Big Portax Stall is a real space saver. He has an incomparable partitioning system. The new concept allows the transport of two horses without contact between the horses. The Big Portax Stall is a real space saver. He has an incomparable partitioning system. The new concept allows the transport of two horses without contact between the horses. In order to avoid the contact between the horses during the loading process, the rear part of the partition can be equipped with an additional attachment grid. 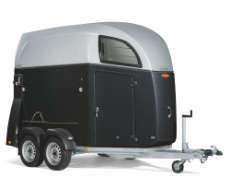 The trailer is perfect for professionals, breeders and stallion owners. Stallions can easily be transported side by side and moreover mare and foil can be transported with the available through-the-line box pole - ideal for professionals and breeders. The dividing wall in the Big Portax Stall consists of two parts, the almost 2.3 meter high, hinged door in the front area and the approximately 2.0 meter high pivoting rear area. The door in the front area can be swiveled to both sides and can also be removed completely if necessary. This allows a comfortable preparation and saddling of the horse in the trailer. The Big Portax Stall is equipped with a large saddle room. The partition to the saddle room has two doors, so you can reach both horses independently. The saddle compartment is equipped with a swiveling saddle holder and many other practical solutions for stowing the equipment.